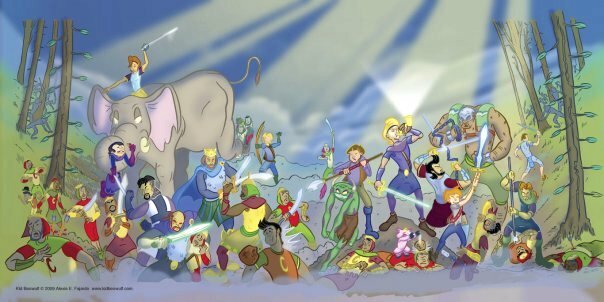 Kid Beowulf And The Song Of Roland - The Graphic Novel! Above: Alexis E Fajardo at the 2009 San Diego Comic Con International (SDCC)! Above: The front cover concept of the upcoming graphic novel. Below: The full wrap-around cover effect! The above pictured graphic novel is one that won't be at your Local Comic Book Shop, (LCBS) during 'Indy Comic Book Week', because it won't be out for a while until 2010! However its' predecessor, "Kid Beowulf and the Blood-Bound Oath" could still be on the shelves for you to purchase there! 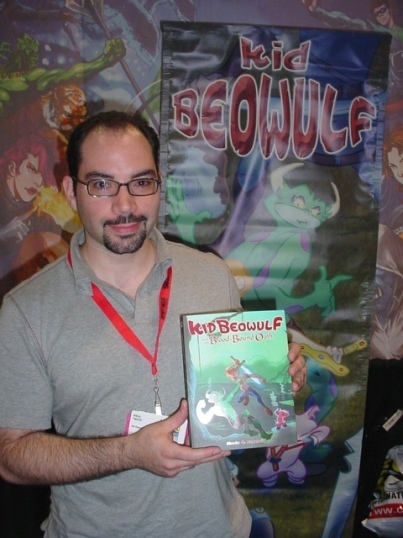 Yesterday morning, Michael D Hamersky became Kid Beowulf's 100th fan! Congratulations Michael! As a special thank you, we will be sending Michael an advance galley of the next Kid Beowulf adventure, KID BEOWULF AND THE SONG OF ROLAND. Michael, we hope you enjoy this sneak peak! This was after I had met the creator of the series, Alexis E Fajardo, at the 2009 San Diego Comic Con, and blogged about him in a 'Featurette' section of this Blog, as seen by clicking here! I saw the Facebook Fan Page for Kid Beowulf, and wanted to be informed about new developements of this series, so I became a 'Fan', not realizing that there was a contest going on! "Inspired by the epic poem BEOWULF, Kid Beowulf follows the journey of 12-year-old twin brothers, Beowulf and Grendel as they travel to distant lands and meet fellow epic heroes therein! Currently slated at a 12 book series, their adventures begin in their native Geatland and Daneland. Book 2: Kid Beowulf & the Song of Roland takes place in France, while book 3: Kid Beowulf vs. El Cid takes place in Spain." 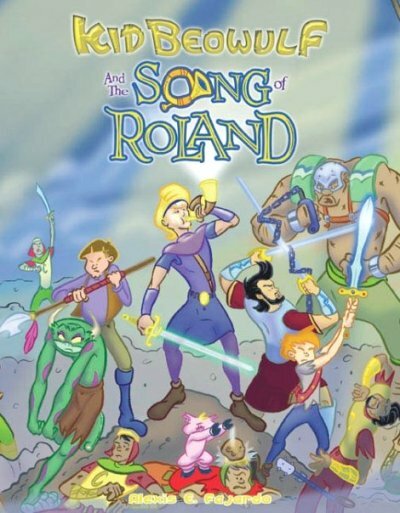 "The Song of Roland launches twelve-year-old twin brothers Beowulf and Grendel into their second adventure, bringing readers along in their journey into literary history—this time, introducing the French tales of Charlemagne and his 12 peers. Wholly original, the Kid Beowulf series stays true to its inspired characters and histories while weaving new imaginings of “what if…” and capturing the imagination of kids and teachers alike." OK, so that's what this graphic novel's concept is about and the credits. Well, in the earlier blog post from November 19th, 2009, I mentioned that Tina was very interested in this proposed series. 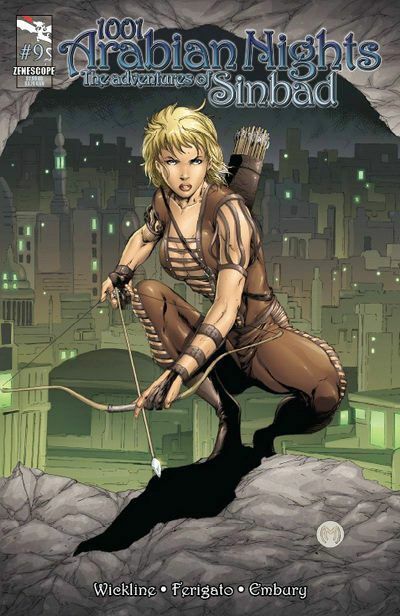 I also mentioned that: "Tina and I viewed a few pages of this presentation at the 2009 Comic Con International: San Diego, (a.k.a. SDCC). We did not receive a copy of the full format for possible review". We were given a 'press kit', which increased my interest in the proposed series at that time. So I was very pleased to see that I had 'won' an advance galley at the Facebook Fan Page for Kid Beowulf for being the 100th Fan! The graphic novel was shipped promptly by Bowler Hat Comics! Here at Make It So Marketing Inc., we do receive many publications for possible mention / review. When I first opened up the package, I saw that the graphic novel was very 'heavy' in dialogue text, as well as in actual weight of the graphic novel. It's actually 259 page long! So I put it to the side for a few days as I wanted to give it an ample opportunity to be read fully and carefully for possible review here. I found the time this past week to read it totally through. There is a lot there in those 259 pages! Tina and I were originally impressed with the concept of this series, and I've been newley impressed with what happened in this second part of the journey of the twin brothers! There are a lot of 9 panel pages, plus a lot of dialogue going on. Plus a wide cast of characters for this storyline. There was a lot to see and read in this graphic novel. Sometimes that could be a little overwhelming, but here everything was presented very smoothly and in an entertaining way. I found myself wanting to continue reading, but found that with my schedule, that it took several nights to finish. There is a lot here for the cover price of $17.95. The storyline is charming, witty, and made for a good read. The artwork is styled right for this story, and being printed in black and white format does not hurt this storytelling. I like Alexis' concept and implementation in this second of the proposed series. The graphic novel is stated to be for all ages, and I would agree with that. It would be a good read for parents to read to their younger children, or for older kids to read for themselves. Plus it isn't "dumbed down". Young adults and older persons could find this to be an amusing and adventuresome story! "We'll be launching the book in April, 2010. We're working on a series of events to coincide with Stumptown Comics Fest in Portland, the weekend of April 24–25." My thanks to Bo Johnson of Bowler Comics for shipping this 'prize' to me so quickly! 2009 LONG BEACH COMIC CON PHOTO: I am still running photos from comic cons that we have been to this year. 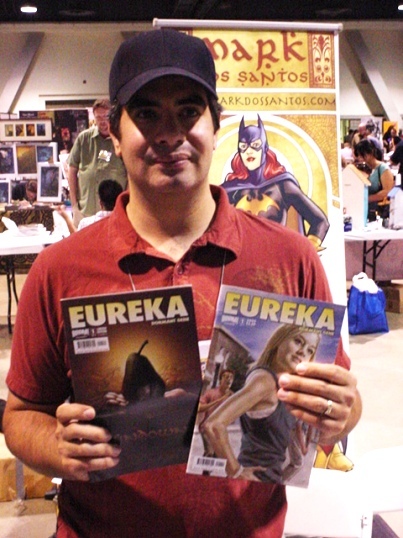 Below is a photo of Mark Dos Santos, whom I had never met before, at his table in Artists Alley at the 2009 LBCC. What drew my attention to his table, besides the great looking banner that is directly behind him, was the EuREKA comic books that he is shown holding! The comics are from a different series than the one we have read. Both Tina and myself are fans of the TV Show, and have blogged on the earlier series from 2008, as well as on episodes from the TV show itself. 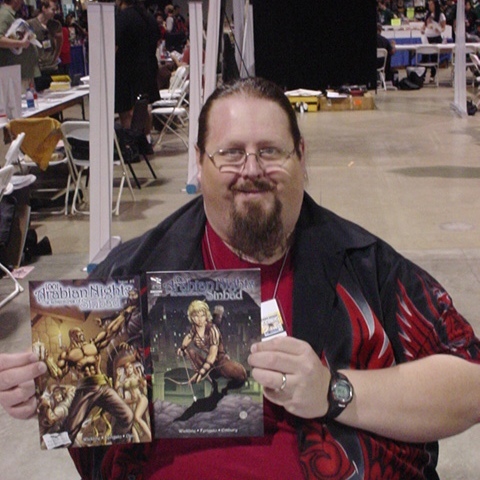 This series that Mark was involved in was published in 2009 and titled EuREKA: Dormant Gene. We have not yet read this newer comic book series. Other than meeting Mark very briefly, I don't know much about him or his work. From his Facebook Group Page I found this very brief bio: "Mark resides in Pasadena, CA orginally from Union, New Jersey. He's been drawing since he started watching Saturday morning cartoons". Mark did the pencils and inks for Grimm's Fairy Tales #20, and an 8 page story in Cthulhu Tales: Chaos of the Mind #3, among other projects. The above photo of Mark is just one of the hundreds I shot at the 2009 Long Beach Comic Con. It was the 1st Annual LBCC, and Tina and I are looking forward to the 2010 LBCC!